In 2013, one day before the 150th anniversary of its formation the Socialist International, the German Social Democratic Party’s predecessor, was weakened by the foundation of the Progressive Alliance, a network of 80 social democratic, socialist and progressive parties and trade unions. Nowadays, neither the Socialist International, which still exists today, nor the Progressive Alliance seem to be powerful voices in international politics. Besides being lame ducks, recurring theories claim that today, Social Democracy has come to a historic end and risks disappearing and dissolving into new forms of political movements. Recognising these sobering findings, one might wonder if there ever existed a true socialist internationalism. Did the solemn speeches given over more than 150 years ago merely pay lip services to the ideal of international cooperation? And did the Socialist International just consist of nationally focused parties? Talbot Imlay answers these fundamental questions in his new book, thereby analysing an important aspect of the age of extremes. For the first time in historiography, he examines the practice of socialist internationalism over half a century, starting with the First World War and covering both post-war periods until 1960. Focusing on the practical cooperation of socialist internationalism, his book contributes to the history of socialism, of internationalism as well as of international history by partially explaining the changing nature of all three in the 20th century. Picking up on the transnational turn in historiography, he perceives the history of socialist internationalism as one of overlapping circles and perceptions rather than firmly closed containers. Thereby he disagrees with Donald Sassoon who presents 20th century’s socialism as a mere collection of national parties, their internationalism being “just a word”, given the mutual loss of trust amongst socialists. On the contrary, Imlay stresses the flowering of socialist internationalism after both world wars that has often been overlooked due to its nationalization processes in the late 1920s and 1950s respectively and its eventual destiny of failure. The admirably composed book starts with a chapter about international socialism during the First World War before dedicating four chapters to the inter-war period and another four to the post-war years, interposed by an entr’acte about socialist internationalism during the 1930s. In the well-balanced chapters, Imlay exploits archival material from twelve countries (Austria, Belgium, Canada, France, Germany, Italy, the Netherlands, Norway, Sweden, Switzerland, the United Kingdom and the United States) discussing an impressive amount of the most relevant English, French, and German historiography. Making important differentiations and new interpretations, the framework of the analysis is composed of several aspects: First, he distinguishes socialist internationalism from its communist and Christian democratic /conservative equivalents by observing that socialist internationalism was based on voluntary cooperation and a well-structured organization. Second, the history of the trade unions and other international organizations with whom the socialists partially cooperated is excluded. Third, he limits his focus to the “big three” socialist parties of Great Britain, France and Germany, eventually expanding specific issues by evidence from socialists of further Western European countries. Finally, Imlay opts for a “high politics approach” privileging party leaders and prominent officials. Already in the first chapter, Imlay argues against most of the older research that presented the outbreak of the First World War as the nail in the coffin of the Socialist International. While many studies concentrated on the minoritarian radical Left, he analyses the attempts of the major European socialist parties to organize international conferences. By doing so, he is able to show that transnational class solidarity and national loyalties were not necessarily contradictory. This is even truer if one looks at the reconstruction of the Socialist International in the second chapter. Despite multiple Internationals after 1918 and individual demands to centralize and expand socialist cooperation, the Labour and Socialist International (LSI) remained the federalist organization of free and equal socialist parties and as such was a key instrument to respond to the praxis of international affairs. Of course, these responses were often highly controversial concerning the international first post-war order until 1925, as chapter three shows. European socialists struggled to find agreements about the peace treaty, the principle of national self-determination, reparations, the League of Nations and security questions. Even more contentious was the issue of disarmament, as Imlay illustrates in the fourth chapter. The LSI did not manage to elaborate a practical programme for disarmament. However, the author argues that it would be overly simplistic to deny any “basic international vision” of the European socialists, as some historians have stressed. Notwithstanding all efforts to find common ground, the praxis of socialist internationalism deepened already existing differences. Imlay correctly states that the more socialists became internationalists, the more vulnerable they became to attacks from nationalists in their home countries. In the fifth chapter regarding empire, the author confirms that – in accord with recent research – only a minority within the LSI supported immediate independence for colonial regions while the majority remained convinced of the backwardness of the colonies in a Eurocentric way. With the fascist menaces in the 1930s, most socialists partially forced underground or into exile focused on the national sphere even though transnational socialist cooperation, especially within the left socialists, never came to a complete standstill. Revising most of the existing historiography on post-war Europe, Imlay clearly demonstrates in the sixth chapter that socialist internationalism was significant for European socialists after the Second World War. He suggests considering the renewed Socialist International in 1951 a “work in progress” (p. 308) that was achieved thanks to well-connected protagonists, their relations often dating back to the 1930s. These contacts were also beneficial regarding the construction of a united Europe in which socialists took an active role. Nevertheless, as the author shows in the seventh chapter, the problem of European socialists consisted in their inability to draft an unequivocal project for a social(ist) Europe and to let the form triumph over the content. As far as the Cold War and European security is concerned, the eighth chapter draws a nuanced picture according to which European socialists fought for disarmament and neutrality while emphasizing different national concerns: Labour for nuclear weapons and disarmament, the SPD for German reunification and the SFIO against German rearmament. The last chapter is dedicated to decolonization. By focusing on the Algerian War (but not exclusively), the author explains why European socialists prioritized national self-determination and national rights over individual minority rights in order to replace visions of empire. In sum, Imlay’s excellent study contains numerous corrections of older works, illuminating new findings, and balanced judgements on a great variety of aspects. Contributing to the history of socialism, he argues that socialist internationalism never died out completely. Regarding the history of internationalism, his focal point is on the practice where socialists could act on both the national and international level. Concerning international history, Imlay considers his book to be a contribution to a new cooperation model in international relations that invites scholars to examine apparently familiar aspects of both post-war periods in a fresh light. He consciously left out more informal elements of socialist internationalism such as friendships, mutual expectations, and shared experiences. These limitations are regrettable albeit comprehensible because otherwise he would have written another book. However, the decision to almost completely fade out Italian socialism is less understandable – not only because of its size and significance, but also since some conclusions would differ had he considered leading Italian socialists such as Pietro Nenni. This is the case e.g. for the Spanish Civil War where Nenni took a leading role on the antifascist side. Therefore, Imlay’s verdict that no leading European socialist fought actively for the Republicans in Spain has to be adjusted (p. 255). Taken altogether, having chosen an institutional and structural approach, social aspects seem to be secondary, thus making the protagonists strangely bloodless and hazy. Yes, there is some information about the persons mentioned – but why not elaborate tell a bit more about their background, their experiences, and their expectations? One could think of other studies about socialist (and communist) internationalism where this approach has been applied successfully. Aside from the content, there are a number of rather formal points to raise. At first, the missing bibliography makes it difficult to overlook Imlay’s impressive amount of international historiography and thus to profit from his knowledge for further research. Since the history of international socialism took place in many different countries, an index of places would have been very helpful. Regarding the index of names, for some persons such as the important Salomon Grumbach, more than half of the actual references in the book are missing in the index. Last, some more diligence concerning German expressions and names (e.g. Bad Godesberg and not Godesburg) would have done good to the overall impression of the reader. Despite these minor critiques which are probably more due to the editor’s policy than due to the author’s omissions, Imlay has written an extremely interesting, well-researched, and stimulating book that will be the central reference for anyone working on socialist internationalism in the future. For studies on shorter periods see e.g. Leonardo Rapone, La socialdemocrazia europea tra le due guerre. Dall’organizzazione della pace alla resistenza al fascismo (1923-1936), Roma 1999; Gerd-Rainer Horn, European Socialists Respond to Fascism: Ideology, Activism and Contingency in the 1930s, New York 1996; John F. Wrynn, The Socialist International and the Politics of European Reconstruction, 1919-1930, Uithoorn 1976. Donald Sassoon, One Hundred Years of Socialism: The West European Left in the Twentieth Century, London 1996, p. 29. For conservative internationalism besides Wolfram Kaiser’s works, now see Johannes Großmann, Die Internationale der Konservativen. Transnationale Elitenzirkel und private Außenpolitik in Westeuropa seit 1945, Munich 2014. Wrynn, The Socialist International, p. 10. Pietro Nenni, Spagna, Milano, Edizioni Avanti!, 1958. See e.g. Thomas Kroll, Kommunistische Intellektuelle in Westeuropa. Frankreich, Österreich, Italien und Großbritannien im Vergleich (1945-1956), 2nd ed. Köln 2009; most recently Christina Morina, Die Erfindung des Marxismus. Wie eine Idee die Welt eroberte, München 2017. 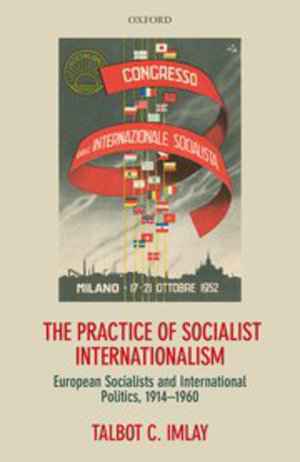 Jens Späth: Rezension zu: Imlay, Talbot C.: The Practice of Socialist Internationalism. European Socialists and International Politics, 1914-1960. Oxford 2018 , in: Connections. A Journal for Historians and Area Specialists, 30.11.2018, <www.connections.clio-online.net/publicationreview/id/rezbuecher-29208>.